Not only does the Ford Escape offer cargo space and reliability, but it also includes amenities that ramp up the excitement level. It's a great option that we have at Sheehy Ford Warrenton for our customers who want a mix of performance and reliability. If you're someone who loves fresh air and natural light, consider getting your Escape with a Vista Roof. 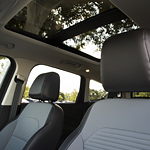 This panoramic roof includes a large panel in front that can tilt open or slide open fully along with a fixed rear skylight. On chilly days, you can appreciate the available heat feature that can be built into the steering wheel. The steering wheel, with or without the heat, has an ergonomic design so your hands can stay comfortable even on long drives. Add-ons for the Escape include the SEL and SE Sport Appearance Packages. The former includes 19" premium wheels and LED signature lighting, and the latter includes Magnetic-painted machines 19" wheels and Magnetic-painted front and rear skid plates, mirror caps, and moldings.